Enough of the graveyard! There are certain views I've been watching, and photographing, all summer long, waiting for the perfect shot (as if there's any such thing.) 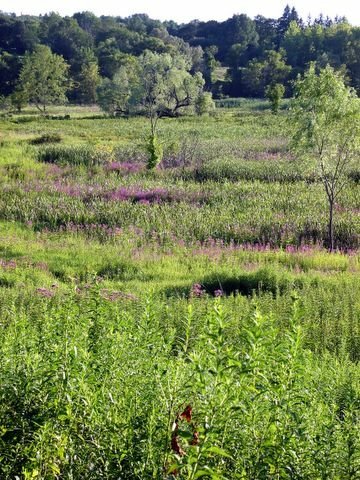 This shot is full of drifts of purple - it's actually an invasive weed, purple loosestrife, but it's lovely nonetheless! I'm still on vacation, Denton is still pushing the button! This is such a beautiful shot. If you hadn't identified the purple flowers, I would have taken them for heather. Great nature shot. You just want to run through it like a kid!